Combining Augmented Reality with education takes learning to a whole new mind-expanding level. 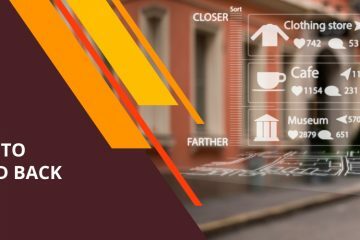 This recent AR and smart gear combination means that Augmented Reality “adds” digital objects to the physical world in real time via a computing-device screen—smartphones, tablets, smart glasses, etc.—and special apps. So what is the goal of Augmented Reality in education? Augmented Reality apps help make teachers’ and students’ lives easier by providing them with exceptional visualization tools. Instead of explaining complex concepts, teachers can show them on an app screen saving time on dry—and often unclear—explanations. Thus, AR technology brings classes to life, makes them more captivating, intuitive and perhaps even awakens students’ interest in difficult subjects. What Augmented Reality really does is provide information in the medium in which students feel most comfortable, attentive and receptive. AR brings to life books and educational materials, guides students through subcontinent jungles or helps them feel like a participant in a historic event. AR can be used when studying any school subject—physics, math, history, biology, literature. Undoubtedly, Augmented Reality and education combined together imply a huge leap towards better subject presentation and learning of educational materials by students of all ages. Its efficacy has been proven by various tests and experiments showing great results. For instance, several experiments were implemented, such as having a certain group of children study educational materials by means of AR, while the control group used typical flipcharts, schemes, etc. The results? The group with AR had about a 90% material absorption rate, a higher level of discipline, as well as 95% of audience’s attention span. The other group’s results ranked well below 50%. Quite impressive AR advantages in education, wouldn’t you agree? 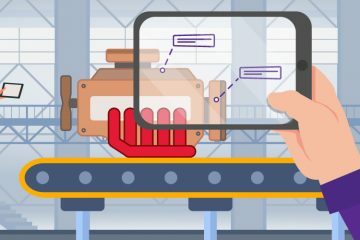 Why does AR so efficiently and positively impact educational techniques? It creates an “effect of presence”: it clearly displays the interrelationship between the real and the virtual worlds. 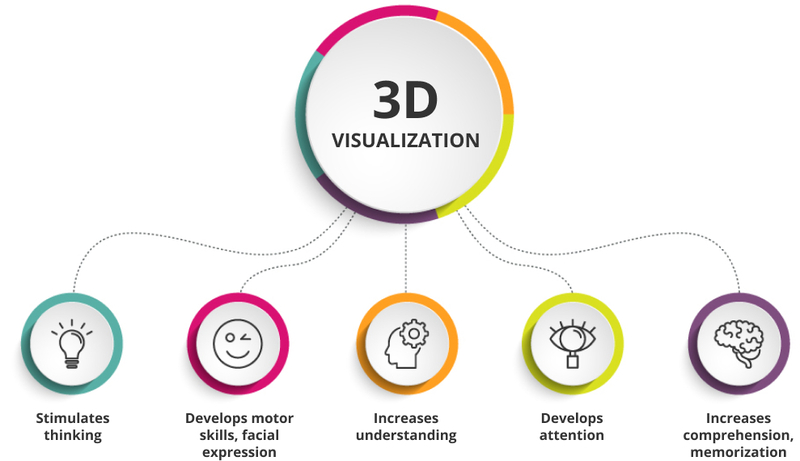 3D-visualization allows entering another reality—the virtual one—attracting the participant and triggers his attention and perception. Irrespective of the studied subject, AR learning raises its attractiveness for students of any age and increases motivation for knowledge acquisition. Students learning AR and using it properly are able to manage AR objects, move, scale and view from different sides. AR gives a huge impetus for development of spatial thinking, enables comprehension of the studied subject deeper and more thoroughly, resulting in higher level of cognition. 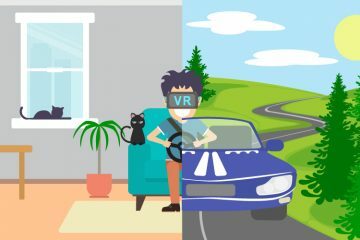 In other words: AR meets the IT-savvy learner’s mind on a level that is most conducive for learning and which fits the learner’s everyday life style like a comfortable slipper. Users can see famous museum exhibits in stunning detail, view trigonometric objects, and run chemical tests impossible to safely perform under real circumstances. 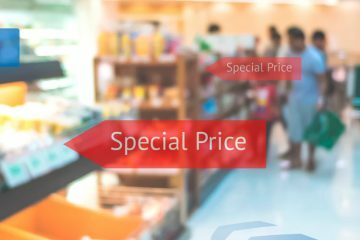 AR in education is expensive. Not all smartphones are compatible with AR technologies; not all students can afford more expensive gadgets that work with AR. Not an insurmountable issue, but an issue which cannot be shrugged off. To successfully develop AR for education, professionals in both arenas must provide the necessary input. Developers must consult with education experts before beginning. If not, expect a raw product requiring considerable improvement. The evolution of AR apps development for education over the last decade has been considerable; a range of solutions have entered the education marketplace. But these solutions still require a high level of technical background with essential time needed for content generation. Thus, it remains a challenge to create an AR educational environment and generate content in an easy and effective way. Additionally, teachers need to be taught and trained so they feel and act confidently while using Augmented Reality in the classroom. To resolve or alleviate this issue, respective training courses in the creation and manipulation of images, videos, stories, etc., are highly recommended. In this context, the teacher must be a student using AR. It is also necessary to create sustainable methodologies for proper application of such technologies in education realm. Moreover, all created material should work in a dynamic new type of classroom. Do you remember those tedious school lessons? Do you remember those dry-as-dust lectures in the sciences, math, history, etc.? What about those equations longer than your arm? Thank goodness they can be nightmares of the past with the aid of AR technology. Junior mathematicians get to use the Pocket Tutor app that helps find straightforward solutions. Just bring your phone close to the paper with the solved task; Pocket Tutor will determine if the solution is right or wrong and, if necessary, display the correct one. For curious people who want to get familiar with the world of insects, there is the AR Flashcards app. It helps visualize rare insects in 3D on your smartphones. It also helps find any information in an encyclopedia. Fun Maps for Kids helps get information and knowledge about our world via digital maps. While scanning a map hanging on the wall, printed on curtains, rugs or just a piece of paper, kids gain access to photos, audio files and animations. Besides AR apps in the classroom used for studying various subjects, we should also mention “virtual teacher” when students listen to the lecture, and then practice under supervision of a teacher who is located somewhere else. Moreover, he or she can interact with students in real time, give them tasks and move around the class. These examples show clearly that technologies from yesterday’s fiction books become a part of our everyday routine: what was fiction yesterday is fact today. Such AR applications in the education domain frequently appear in the market and serve as a great motivating tool for study and education. AR and education perfectly match each other. AR can be applied as a tool for maximizing visualization and interactivity of the learned subject, deeper immersion into it, conducting laboratory works, studies or tests. 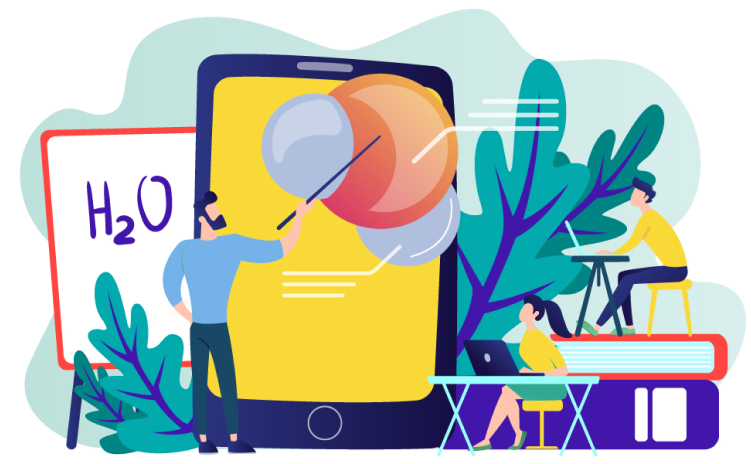 AR technology can be applied for implementation of project tasks, visualization of results while students are working on the project, thus making it as interactive as possible. Hence AR technology allows teachers to involve students in research activities, working out respective learning cases, using up-to-date means and tools, and helping achieve the desired goal—delivering knowledge to the students’ mind efficiently. Figuratively speaking, productive and effective education is a treasure island that can be reached by means of the AR schooner. It is true. Children learn better when they interact with representations of knowledge. It’s really fun and great for children, when they can play and learn.